Green Lantern: Sleepers is a trilogy created by Christopher J. Priest and written by Mike Baron, Michael Ahn, and Priest. Each book focuses on a different Green Lantern—Kyle Rayner, Alan Scott, and Hal Jordan, respectively. Pocket has published a series of Justice League of America novels. Of these, Exterminators by Christopher Golden includes Hal Jordan as part of the team, and Hero's Quest by Dennis O'Neil is a solo Green Lantern story. All of these stories have been made into full-cast dramatizations released by GraphicAudio. Hal Jordan was the featured character in a solo series which was part of The Superman/Aquaman Hour of Adventure (1967) as well as part of the Justice League segments. These would be the character's first animated appearances. Gerald Mohr is the voice of Green Lantern. In addition, Hal Jordan's Green Lantern was an occasional supporting character in the various Super Friends incarnations: Challenge of the Super Friends, Super Friends, Super Friends: The Legendary Super Powers Show, and The Super Powers Team: Galactic Guardians. Michael Rye provided the voice of the Green Lantern for these appearances. Model sheets for Green Lantern John Stewart in Justice League and Justice League Unlimited. John Stewart is a member of the Justice League in the Justice League animated series. In this series, Stewart's ring was initially constrained to permitting him to fly, generating a protective force field, creating walls, and firing energy blasts; this limitation was established as being due to Stewart's mindset, not an inherent limitation of the ring itself (the series' version of Stewart is a former U.S. Marine, not an architect). After being berated by Katma Tui for his unimaginative use of the ring, Stewart has learned to generate complex tools (to defuse a bomb in one instance) and weapons. (He was also shown to be more creative when transformed into a child in the episode "Kids Stuff".) In a development not seen in any other version of the Green Lantern mythos, Stewart's eyes glow green when wearing his charged power ring. The glow fades when the ring runs out of power. The series has been inconsistent about the ring's effectiveness against yellow; Stewart is seen fighting Sinestro in one episode, and the yellow energy does not prove to be a significant problem for the Lantern, although in a later episode of Justice League Unlimited, the Flash threw yellow Jell-O at him, breaking his force field. Stewart's voice is provided by Phil LaMarr. 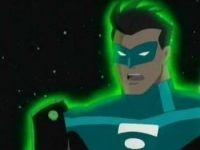 Kyle Rayner appears as Green Lantern in "In Brightest Day...", an episode of Superman: The Animated Series. This version is recruited by Abin Sur, and fights Jordan's old enemy Sinestro (voiced by Ted Levine). Guy Gardner makes a cameo as the mugger who steals Jimmy Olsen's camera. Rayner is voiced by Michael P. Greco. Rayner is briefly mentioned in one episode of Justice League and appears as one of the Green Lanterns attending Superman's funeral in "Hereafter". He later reappears after the series became Justice League Unlimited in "The Return", bearing a far greater resemblance to his comics counterpart. Rayner's appearance (where he and the Corps unsuccessfully attempted to defend Oa from Amazo) finally explains why Stewart is the Green Lantern of Earth; Rayner had been stationed on Oa all along. Will Friedle provides Rayner's voice in "The Return". A character known as Scott Mason / Green Guardsman appears in the two-part Justice League episode "Legends", in which Stewart and several other members travel to a parallel universe. This other universe has its own superhero group, the Justice Guild of America, whose members are modeled on Golden Age versions of the Justice Society of America characters. Green Guardsman is an homage to the Golden Age Green Lantern. His power ring is unable to affect aluminum. The voice of the Green Guardsman is provided by William Katt. The Justice League version of Stewart appeared in several episodes of Static Shock, both as a member of the League and in a solo appearance. Phil LaMarr reprises his Justice League role as Green Lantern, as well as providing the voice for Static. Kai-ro as appeared in Batman Beyond. "The Call", a two-part episode of Batman Beyond, features a future Justice League that includes a Green Lantern who was an eight-year-old Asian child; he later appears as a young adult in the Justice League Unlimited episode "Epilogue". His name was Kai-ro, a tribute to Kairo, Green Lantern's alien sidekick on The Superman/Aquaman Hour of Adventure. Kai-ro is voiced by Lauren Tom. Hal Jordan in Justice League Unlimited. Hal Jordan appears briefly in the Justice League Unlimited episode "The Once and Future Thing, Part 2: Time, Warped" in which the time-traveling villain Chronos causes the timeline to become unstable, with characters changing or disappearing as their history is altered. At one point, Stewart morphs into Jordan, who aids the other characters for several minutes before changing back into Stewart. Jordan is voiced by Adam Baldwin. On the animated TV series Duck Dodgers, the episode entitled "The Green Loontern" includes appearances by many members of the Green Lantern Corps. In this episode, a mixup at the dry cleaners results in Dodgers (Daffy Duck) getting Jordan's outfit and ring. Filmmaker and comics fan Kevin Smith provided the voice of Jordan for this cameo. Other Green Lanterns that appear in this episode are Kilowog (voiced by John DiMaggio), Katma Tui (voiced by Tara Strong), Boodikka (voiced by Grey DeLisle), Ch'p (voiced by Frank Welker), and Sinestro (voiced by John de Lancie), as well as nonspeaking appearances by Stewart, Arisia Rrab, G'nort, and Guy Gardner. In the fourth-season finale of The Batman, "The Joining", the Justice League is introduced. Hal Jordan is included among its members, in a non-speaking cameo. He next appears in the fifth-season episode "Ring Toss", voiced by Dermot Mulroney and again in the 2-part series finale, "Lost Heroes". Guy Gardner appears in multiple episodes of Batman: The Brave and the Bold, voiced by James Arnold Taylor. He appears briefly in the pre-title segment of "Day of the Dark Knight! ", in which he ignores Batman's advice and accidentally frees an imprisoned alien by pouring coffee on him. In the episode "The Eyes of Despero! ", Gardner, G'nort, Sinestro and Mogo join forces with the Batman to stop the villain Despero from using his mental powers to turn the Green Lantern Corps into an army of mind controlled slaves. Other members of the Lantern Corps are seen, including Ch'p, Kilowog, Medphyll, and Hal Jordan. Jordan later makes a cameo appearance as a member of the original Justice League of America in "Sidekicks Assemble! ", and is mentioned in "Darkseid Descending!" when Guy joins the Justice League International. A heroic version of Sinestro (clad in a Sinestro Corps uniform) briefly appears "Deep Cover for Batman! ", where he is shown as one of the superheroes being held captive by the Injustice Syndicate. In this series, Hal is voiced by Loren Lester, Sinestro is voiced by Xander Berkeley, G'nort is voiced by Alexander Polinsky, and the Guardians are voiced by J. K. Simmons and Armin Shimerman. In the episode "Crisis: 22,300 Miles Above Earth! ", Alan Scott, the original Green Lantern, appears as a member of the Justice Society of America. The JSA and the new Justice League International are meeting at a mixer on the Watchtower. The JSA is quickly disappointed when they learn they were not meeting the original Justice League which had broken up recently. Things get bad and both teams start fighting each other. Meanwhile, Batman is trying to stop Ra's Al Ghul from firing a fusion rocket into the sun triggering solar flares that will melt the polar ice caps and flood the planet. He sends a distress signal to the Watchtower and the two leagues stop fighting and team up to defeat Ra's. In this episode, he is voiced by Corey Burton. Hal Jordan, John Stewart, Guy Gardner and Alan Scott appear in the Young Justice animated series. Jordan and Stewart appear as members of the Justice League, while Scott appears as a member of the Justice Society. Jordan and Stewart make their first appearances in the episode "Fireworks", Gardner appears in "Revelation" in a cameo to help the Justice League, and Scott appears in the episode "Humanity" in a flashback. None of them are voiced except for Stewart, who was voiced by Kevin Michael Richardson in the episode "Failsafe". In the episode "Agendas", Jordan and Stewart were convenes recruitment for the Justice League new members, both Jordan and Stewart immediately dismiss Gardner from the Flash's idea. Hal Jordan appears as the main character in Green Lantern: The Animated Series, voiced by Josh Keaton. Other characters include Kilowog, the Guardians of the Universe, Carol Ferris, Salaak, Sayd, Saint Walker, and Zilius Zox, among others. The main antagonists of the first arc of the show are the Red Lantern Corps, led by Atrocitus, as well as the Manhunters. Guy Gardner appears as a recurring character while John Stewart is mentioned and Alan Scott is alluded to. Hal Jordan appears in the web series DC Super Hero Girls as a student at Super Hero High, voiced again by Josh Keaton. Jessica Cruz is also featured in the series, voiced by Cristina Milizia. Hal Jordan appears in Justice League Action, with Josh Keaton reprising his role. Guy Gardner alongside other members of the JLA, from the failed Justice League pilot. Howard Murphy played Green Lantern in the live action Legends of the Superheroes TV specials in 1979. The role of Sinestro was played by comedian Charlie Callas. The unsuccessful 1997 pilot for a live-action Justice League of America television series included Matthew Settle as Guy Gardner, although the pilot's Green Lantern uses only the name and costume of the comic book Gardner. Alan Scott briefly appears in the Smallville episode "Absolute Justice" which featured the Justice Society of America. He is a superhero in the 1970s and a CEO of an unnamed broadcasting company, who was arrested for fraud by the government in a mission to take down the Justice Society of America. He, like the others, tried to take the blame for all crimes, though he and the rest were never convicted. As the law was now aware of his superhero identity, Scott retired from heroics. In 2010, Clark Kent and Chloe Sullivan find old black-and-white footage of Alan (his power ring is visible on his left hand), along with his criminal record. Very little is said about him, other than that he is the CEO of a broadcasting company, but it was confirmed that he was still alive by Stargirl and hinted at that he had children. His power ring and Lantern battery are later shown in a display case at the JSA Brownstone, as well as in his portrait in a JSA painting. Alan Scott is played by Doug Pinton. Subsequently, John Stewart and the Green Lantern Corps appear in the comic book continuation of the show. Within Arrowverse, there are several references and nods to Green Lantern and its characters. Arrow executive producer Marc Guggenheim tweeted a photo of Ferris Air with the slogan "We fly without Fear" as an easter egg of Green Lantern. The series' star Stephen Amell has talked about seeing Green Lantern in the series. In The Flash episode, "Rogue Air", The Flash mentions that Ferris Air shut down after one of their test pilots disappeared, alluding to Hal Jordan. In another episode "Welcome to Earth-2", Jordan's name is referred from a list of contacts on a phone at Earth-2 Barry and Iris's home, implying his Earth-2 doppelgänger's existence. In the season 4 premiere "Green Arrow", a man wearing an aviator jacket with the name "Jordan" on it appears at the bar where Oliver Queen and Amanda Waller are, and an advertisement sign proclaims "In brightest day, In blackest night, Come to Coast City, When money's tight". Alan Scott is also mentioned in Legends of Tomorrow as the father of Obsidian (Todd Rice). In the Arrow episode Elseworlds, Part 2, Barry Allen of Earth-90 mistakes John Diggle for John Stewart, asking him where is his ring. Ryan Reynolds as Hal Jordan in Green Lantern. A live-action film titled Green Lantern starring Ryan Reynolds as Hal Jordan and directed by Martin Campbell was released on June 17, 2011. The film, being the character's first theatrical appearance, featured an origin story. The movie was neither well-received nor financially successful. Some of the film's most criticized aspects were the CGI elements that featured heavily. Though the movie was intended to launch a franchise of its own, the studio abandoned plans that were to follow. An unidentified Green Lantern, who bears a strong resemblance to Yalan Gur, appears in a flashback in Justice League (2017), during the sequence which depicts humankind, Amazonians, Atlanteans, the Olympians and the Lantern fighting Steppenwolf and his army of Parademons. The Lantern conjures a giant hammer with their power ring to fight the armies of Apokolips, but is overpowered and killed by Steppenwolf. The power ring then leaves their finger and flies away to find a new worthy individual to inherit it. A rebooted adaptation of the Green Lantern titled Green Lantern Corps is in development as a part of the DC Extended Universe, intended to be the tenth installment, with a July 24, 2020 release date. The movie will reportedly feature numerous Green Lanterns, with a couple of them being from Earth as the main characters. It was later stated that Hal Jordan may appear in a Justice League sequel. In January 2017, Deadline reported that David S. Goyer and Justin Rhodes were hired as co-screenwriters, with the story written by Goyer and Geoff Johns. Goyer will also produce the film with Johns and Jon Berg. Hal Jordan is the main character in the direct-to-video animated film Green Lantern: First Flight, portrayed by Christopher Meloni. The film was released on July 28, 2009. Nathan Fillion voices Hal Jordan in Green Lantern: Emerald Knights. Hal Jordan is one of the main characters featured in the DC Universe animated film Justice League: The New Frontier. He is voiced by David Boreanaz. Nolan North voices Hal Jordan in the 2010 direct-to-DVD animated film, Justice League: Crisis on Two Earths. Hal Jordan appears as a member of the Justice League in Justice League: Doom, with Nathan Fillion reprising his role. Nathan Fillion reprises his role as Hal Jordan in Justice League: The Flashpoint Paradox. Hal Jordan appears in Lego Batman: The Movie – DC Super Heroes Unite, an adaptation of the video game of the same name, with Cam Clarke reprising his role. Hal Jordan appears in The Lego Movie, voiced by Jonah Hill. The film marks Green Lantern's second theatrical appearance. In the film, there's a recurring joke where Green Lantern would find and try to help Superman, making the latter a little awkward. Superman even tries to commit suicide by asking for Kryptonite when he is put next to Green Lantern in the Torture Room. Hal Jordan appears in the animated film Justice League: Throne of Atlantis, with Nathan Fillion reprising his role. Guy Gardner appears in the animated film Lego DC Comics Super Heroes: Justice League vs. Bizarro League, with Diedrich Bader reprising his role. Hal Jordan appears in the animated film Lego DC Comics Super Heroes: Justice League – Attack of the Legion of Doom, with Josh Keaton reprising his role. Hal Jordan appears in the animated film Lego DC Comics Super Heroes: Justice League – Cosmic Clash, voiced again by Josh Keaton. John Stewart appears in the animated film Justice League Dark, voiced by Roger Cross. Hal Jordan appears as a member of the Justice League in The Lego Batman Movie, with Jonah Hill reprising his role. The film would mark Green Lantern's third theatrical appearance. In the film, he makes a brief cameo at the 57th Justice League anniversary and tells Batman that he hasn't received emails from Superman for years. John Stewart appears as a member of the Justice League in Teen Titans Go! To the Movies, with his voice provided by rapper Lil Yachty. Jessica Cruz appears in the animated film Lego DC Comics Super Heroes: Aquaman: Rage of Atlantis, with Cristina Milizia reprising her role. Hal Jordan appears in The Death of Superman, with Nathan Filion reprising his role. Hal Jordan appears in Reign of the Supermen, once again voiced by Nathan Fillion. Jessica Cruz appeared in Justice League vs. the Fatal Five, voiced by Diane Guerrero. Hal Jordan, John Stewart, Guy Gardner, and Kyle Rayner appear as holograms in The Legion's Clubhouse. The "Emerald Twilight" storyline was to be adapted into a video game for the Super NES by Ocean Software. The game would have allowed players to assume the role of Kyle Rayner and take on the threat of Hal Jordan as Parallax. The game was cancelled. John Stewart appears as a playable character in Justice League Heroes. Hal Jordan and Kyle Rayner are featured as unlockable characters. John Stewart appears as a playable character in the Justice League: Heroes United arcade game. Hal Jordan appears as a playable character in the crossover fighting game Mortal Kombat vs. DC Universe game. His special moves include a fist-shaped projectile, hammer constructs to smash foes, a large hand that slams foes to the ground, and a brick wall shield that absorbs projectiles. His heroic brutalities involve encasing the opponent in a force bubble and then rapidly contracting it, and crushing the opponent between two large hammers. In the game's trailer, Green Lantern is seen being beaten by Sonya Blade using martial arts and super strength before Captain Marvel saves him, and is seen defending a weakened Superman from Liu Kang (his counterpart from the Mortal Kombat Universe) in the Fortress of Solitude. Later, Sonya fights Green Lantern again and Green Lantern defeats Sonya Blade. He is also seen speaking with the Guardians of the Universe and being confronted by Lex Luthor, who is consumed by the "combat rage" and asserts that he deserves to have Hal's power ring. Guy Gardner appears as a playable character in the Wii version of the Batman: The Brave and the Bold video game, with Hal Jordan being playable in the DS version. Arisia Rrab and Kilowog make appearances as well. Also, a statue of Alan Scott can be seen in the Gotham City level of the Wii version. A Green Lantern video game based on the live-action film has been released under the title Green Lantern: Rise of the Manhunters for the Xbox 360, PlayStation 3, Nintendo Wii, Nintendo DS, and Nintendo 3DS. Alan Scott, Hal Jordan, Guy Gardner, John Stewart, Kyle Rayner and Kilowog appear in DC Universe Online. John Stewart fights alongside the heroes against Sinestro and the Sinestro Corps, Hal Jordan and Green Arrow fight alongside the heroes against Eclipso and an out-of-control Spectre, Kilowog is the target of a bounty mission for villains and Kyle Rayner is a boss in the Coast City instance along with Amon Sur and Atrocitus. The player also helps Hal Jordan and Kilowog, along with other unnamed Green Lanterns in the Star Labs instance, which also includes Sinestro and Arkillo. The Corps is heavily involved in the entire "War of the Light" saga spread over several episodes, culminating in the final showdown against Nekron. Hal Jordan appears as a playable character in Lego Batman 2: DC Super Heroes. Hal Jordan appears as a playable character in the fighting game Injustice: Gods Among Us, as both a Green Lantern and a Yellow Lantern. Yellow Lantern Hal Jordan is from a parallel Earth and fights for Superman's Regime, after becoming a member of the Sinestro Corps. Green Lantern Hal Jordan defeats both his counterpart and Sinestro on occasion and in the end they are forced to stand down when the heroic Superman defeats his villainous counterpart and his regime. Yellow Lantern and Sinestro are taken to Oa by Green Lantern to stand trial for their crimes. John Stewart and Jessica Cruz are also featured as alternate skins for the character. Hal Jordan appears as a playable character in The Lego Movie Videogame. Hal Jordan, Guy Gardner, John Stewart, Kyle Rayner, Kilowog and Duck Dodgers appear as playable characters in Lego Batman 3: Beyond Gotham. Hal Jordan and two parallel Earth versions of him appear as playable characters in the multiplayer battle arena game Infinite Crisis, voiced by Adam Baldwin (Prime), Nolan North (Atomic), and JB Blanc (Arcane). Hal Jordan appears as a playable character in Injustice 2. John Stewart is also featured as an alternate skin. In the game story, after being rehabilitated by the Guardians, Hal Jordan was able to reclaim his post as Green Lantern of Sector 2814. Now as an ally of Batman in the protection of the world, Hal is willing to prove to everyone (including himself) that he deserves a second chance. In his ending, after bringing Brainiac to Oa to stand trial, Hal learns that Sinestro has escaped imprisonment. Since the Green Lanterns are too weak from battling Superman's regime for a frontal assault, Hal agrees to go undercover as a Yellow Lantern, hoping that his willpower will be able to withstand the ring's addiction. Hal Jordan, John Stewart, Jessica Cruz, Simon Baz and B'Dg appears as playable characters in Lego DC Super-Villains. ^ 🕎Josh🎄hanukKeaton🕎 [@joshkeaton] (July 21, 2016). "Glad to be coming back as Hal Jordan on #JusticeLeagueAction #SDCC2016 and joining this incredible cast and crew!" (Tweet) – via Twitter. ^ ""ARROW'S" STEPHEN AMELL TEASES SEASON THREE". Comic Book Resource. September 10, 2014. Retrieved September 10, 2014. ^ Steinbeiser, Andrew (August 31, 2015). "Arrow Season 4: Coast City Art Teases Green Lantern". Comic Book. ^ Abrams, Natalie (September 9, 2015). "Arrow Shifts To A Lighter Tone In Season 4". Entertainment Weekly. ^ Rob Keyes (March 4, 2010). "Green Lantern Production Begins Today!". Screen Rant. Retrieved March 15, 2010. ^ Sneider, Jeff (May 10, 2016). "'Godzilla 2,' 'Godzilla vs. Kong' Stomp Out New Release Dates". The Wrap. ^ "''Animated "Green Lantern: First Flight" Release Pushed Forward; New Image Released'' ''The World's Finest'' (April 6, 2009)". Worldsfinestonline.com. Retrieved September 13, 2010. ^ "Green Lantern [SNES - Cancelled]". Unseen64.net. Retrieved March 9, 2013. ^ "Kitana, Jax, The Joker, and Green Lantern Confirmed". Kotaku.com. July 25, 2008. Retrieved September 13, 2010. ^ "Batman: The Brave And The Bold: The Videogame Trailer". Leagueofcomicgeeks.com. June 1, 2010. Retrieved September 13, 2010. ^ "Boss Says BATMAN: BRAVE & BOLD Game is Just Like the Show". Newsarama.com. August 26, 2010. Retrieved September 13, 2010. Green Lantern is a steel stand-up roller coaster located at Six Flags Great Adventure in Jackson Township, New Jersey. Green Lantern stands 155 feet (47 m) tall and features a top speed of 63 miles per hour (101 km/h). The 4,155-foot-long (1,266 m) ride features five inversions and a duration of approximately 2​1⁄2 minutes. The ride was manufactured by Swiss firm Bolliger & Mabillard. Green Lantern is fairly similar to Rougarou at Cedar Point, but is taller, faster, and features one more inversion. The ride originally operated at Six Flags Kentucky Kingdom in Louisville, Kentucky from 1997 to 2009, where it was known as Chang. Upon opening in 1997, it set world records for this type of coaster in height, drop, speed, length and number of inversions. The introduction of the ride caused Kentucky Kingdom to achieve record attendance levels. After Six Flags abandoned Kentucky Kingdom in 2009, the ride was relocated to Six Flags Great Adventure. The ride debuted in 2011 as Green Lantern, replacing the former Great American Scream Machine roller coaster. Green Lantern: Original Motion Picture Soundtrack is a soundtrack to the film of the same name, and it was released in stores on June 14, 2011. The soundtrack was composed by James Newton Howard, who also worked on the other Warner Bros/DC Comics based films Batman Begins and The Dark Knight with Hans Zimmer. The soundtrack was published by WaterTower Music. Green Lantern Coaster is a steel roller coaster at Warner Bros. Movie World on the Gold Coast, Queensland, Australia. The ride is themed after DC Comics' Green Lantern and is located within the park's DC Comics superhero hub. The ride is an El Loco roller coaster manufactured by S&S Worldwide, characterised by a tight circuit featuring a beyond-vertical drop and an outward banked turn. It holds the record for the steepest drop of any roller coaster in the Southern Hemisphere, and the second steepest in the world. Green Lantern Coaster officially opened on 23 December 2011. Justice League of America is a 1997 television film and an unsuccessful pilot produced by CBS and directed by Félix Enríquez Alcalá, based on a team of fictional DC Comics superheroes from the comic of the same name. The film centers on a female meteorologist who gains superpowers and is later inducted into the "Justice League", while the city of New Metro is held for ransom by a terrorist armed with a weather control device. The film is interjected with mock-interviews of members of the Justice League, speaking about life as a superhero in the past tense, preceding the events of the film. Animated television series first aired in the 1960s.